8:15-10pm. Garrett "G. Love" Dutton is celebrating his 25th year as a touring and recording artist. $29.50/Advance tickets. Ries Bros. Open 7-8pm. Garrett "G. Love" Dutton is celebrating his 25th year as a touring and recording artist. 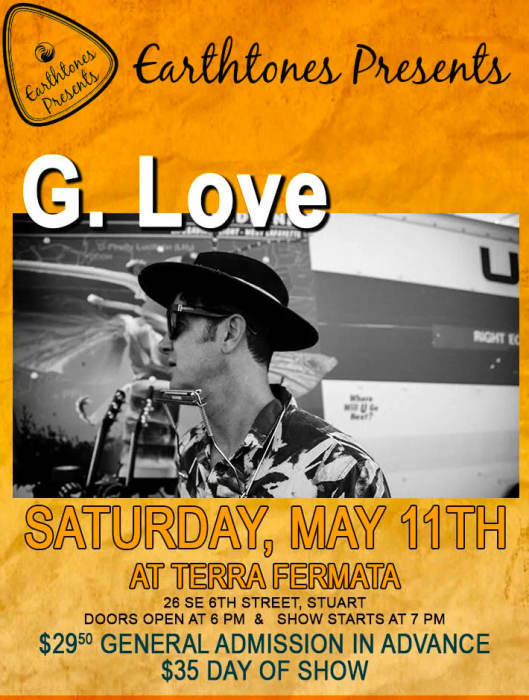 With over 15 records released, G. Love has been an influence to artists such as Jack White, Jack Johnson, The Avett Brothers, Slightly Stoopid and many more. 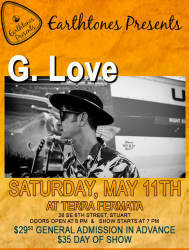 With his signature blend of Delta Blues, Hip Hop, Funk, Rock and Roll and Jazz, G has literally created his own funky stew of American music. Expect a high-energy mashup of funky vibes and songs written from the front porch to get the world smiling and dancing to the positive message of Love and the Blues. The Ries Brothers (pronounced "Rees"), a duo from Tampa Bay, FL, blend rock, blues, funk, and reggae into a soulful-sophisticated sound. Older brother Charlie (22) sings lead vocals while simultaneously playing drums and keyboard bass giving the band it's unique and full sound. Younger brother Kevin Jordan (19) completes the band's "sonic creativity" on guitar, provides background vocals and co-writes many of their songs.